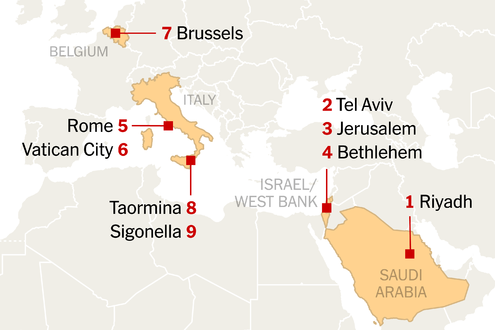 JERUSALEM — Unlike the royal pomp and ceremony with which President Trump was greeted over the weekend in Saudi Arabia, the plans for his arrival on Monday in Israel had devolved into an unseemly political ruckus before Air Force One touched down. 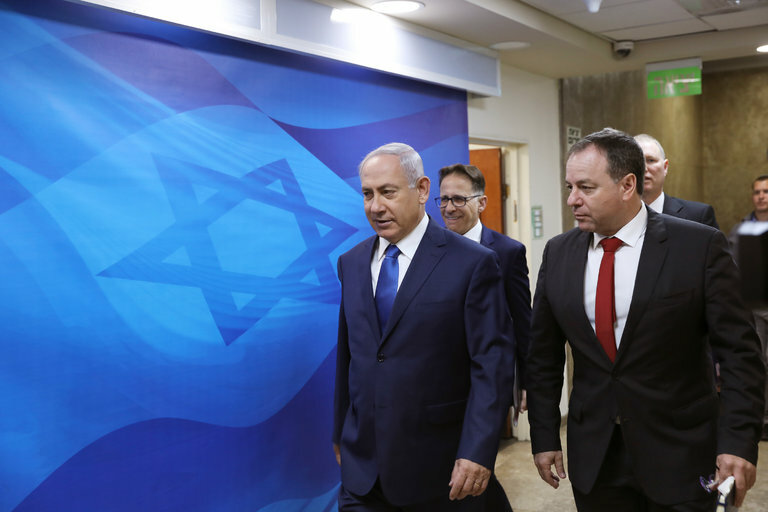 Mr. Netanyahu also had to wrestle much of Sunday in a closed cabinet meeting with right-wing ministers of his coalition to win approval of even modest gestures meant to encourage the Palestinian economy and ease conditions in the West Bank and elsewhere. The confidence-building measures were aimed as much at convincing Mr. Trump of the Israelis’ commitment to seek an agreement as they were intended for the Palestinians. Mr. Trump has said that he wants to seal the “ultimate deal” to resolve the decades-old Israeli-Palestinian conflict, an ambitious goal that has so far eluded two generations of American presidents and numerous international mediators. Expectations are low for any major breakthrough during Mr. Trump’s nearly 36-hour visit to Israel and the West Bank, but neither Mr. Netanyahu nor President Mahmoud Abbas of the Palestinian Authority wants to risk angering the American president, or be portrayed as the reluctant party to resuming long-stalled peace talks. Mr. Trump is scheduled to meet Mr. Abbas on Tuesday in Bethlehem, in the West Bank. The Palestinian areas are seething, with a mass hunger strike of prisoners in Israeli jails entering its sixth week and violent protests in support of the strike that have turned deadly. But the preparations for the visit have been charged, both logistically, with major schedule changes that have left the Jerusalem police scrambling, and regarding some diplomatic and emotional issues of fundamental importance to the Israelis and Palestinians. Some in the Israeli news media have already described the visit as “hysterical,” rather than “historical.” And squabbling within Mr. Netanyahu’s governing coalition has marred much of the festivity surrounding Mr. Trump’s visit: Right-wing politicians are disappointed that the Trump administration appears to be adhering to longstanding American policy regarding the Israeli-Palestinian conflict, and they are agitating for Mr. Netanyahu to take a tougher stance. The Israeli government is in any case likely to be more focused on American help in containing Iran’s influence in the region, former Israeli officials said. Still, many experts say any cooperation between Israel and an American-led coalition of Sunni Arab states to counter Iran would require progress on the Israeli-Palestinian front. In an interview published Sunday in Israel Hayom, a newspaper largely supportive of Mr. Netanyahu, Mr. Trump said, “I think we have a very, very good chance of making a deal.” The interview was conducted in Washington on Thursday, shortly before Mr. Trump left for the Middle East. The measures the Israeli government approved for the Palestinians include the expansion of a West Bank industrial zone; the phased extension of operating hours at the Allenby Bridge between the West Bank and Jordan; and the authorization of Palestinian construction in the 60 percent of the West Bank that Israel fully controls, known as “Area C.” The authorization mostly pertains to buildings already constructed and slated for demolition on the edges of existing Palestinian towns. Israeli officials played down the gestures to the Palestinians after approving them. In deference to hard-liners in the cabinet, the government also announced the establishment of a committee to retroactively push for the legalization of settler outposts and homes in the West Bank built without government authorization. Some of the incentives appeared to be recycled. At a meeting last September at the United Nations, Israeli officials presented incentives including an upgrade to the Allenby Bridge and master plans for authorizing building in Area C.
Mr. Trump is scheduled to visit the Western Wall in the Old City of Jerusalem, making him the first sitting American president to visit the holiest site where Jews can pray. But even that has caused a political disagreement. Mr. Netanyahu wanted to accompany Mr. Trump and his family to the wall, according to Israeli news reports, to emphasize Israeli ownership of the contested area, but American officials nixed that idea, saying it is a private visit. The wall is in East Jerusalem, an area that Israel conquered from Jordan in the 1967 Arab-Israeli War and then annexed in a move that has never been internationally recognized. The Palestinians also claim the Old City, with its Jewish, Muslim and Christian sacred sites, as part of the future capital of a Palestinian state. On Sunday, Israel kicked off its celebrations marking 50 years since the reunification of the contested city. Bezalel Smotrich, a legislator from the Jewish Home party, suggested that members of the Knesset, or Israeli Parliament, use their parliamentary immunity to pass through the police lines at the wall during Mr. Trump’s visit as a way of asserting Israeli sovereignty. In another twist, the Americans requested Sunday that a dinner to be hosted by Israel’s defense minister, Avigdor Lieberman, on Monday for senior members of the American delegation be canceled. The guests were to include Secretary of State Rex W. Tillerson; Mr. Trump’s daughter Ivanka Trump; and his son-in-law, Jared Kushner. No reason was given for the cancellation. Israelis have also been upset by Mr. Trump’s plan for a 15-minute visit to Yad Vashem, the official Holocaust memorial in Jerusalem. “He is taking the opportunity to commemorate the victims of the Holocaust and to identify with the memory, which is meaningful,” said Simmy Allen, a spokesman for Yad Vashem. But Mr. Allen said he could not imagine the program there taking less than half an hour.